COMMUNICATION IS THE act of exchanging information by signals or messages, including writing, talking and gesturing. The key word here is “exchange.” As we know, communicating clearly with someone is not always easy, even when the conversation is conducted using words spoken on dry land. For instance, if you are across a crowded, noisy room from the person you are trying to communicate with, they might not hear your message. Or if you’re speaking English to a non-English speaker, the message might not be understood even if the person is near enough for you to whisper in their ear. For solid communication to happen, your message must travel in a loop that sees it conveyed, received, understood, acknowledged and appropriately responded to. If the message gets hung up along the way, communication breaks down. This process becomes more complicated when we put a regulator in our mouth and jump into the water. For starters, having the regulator in our mouth makes talking difficult. Secondly, water makes sound waves go wonky, playing tricks on how we perceive sound underwater. This is why, as part of the Open Water Diver certification course, we all learn a variety of underwater hand signals commonly used in diving. 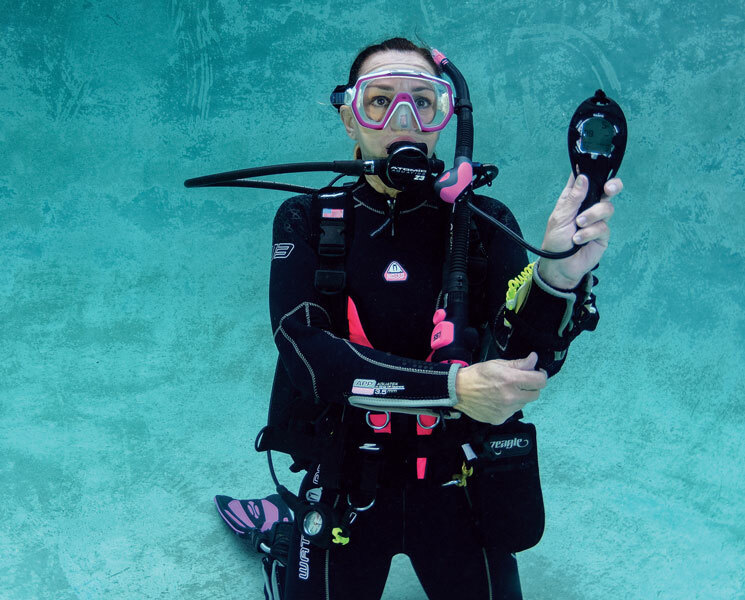 In this article we’ll cover using hand signals and accessories for effective underwater communications. Good communications starts long before you submerge. Make sure you take the time to discuss with your dive buddy or buddies the various ways in which you all will communicate while diving. This includes going over all the hand signals you will use and what they mean. If you use signals beyond the standard ones taught in your certification course, be sure to demonstrate them to others — including what each signal means. 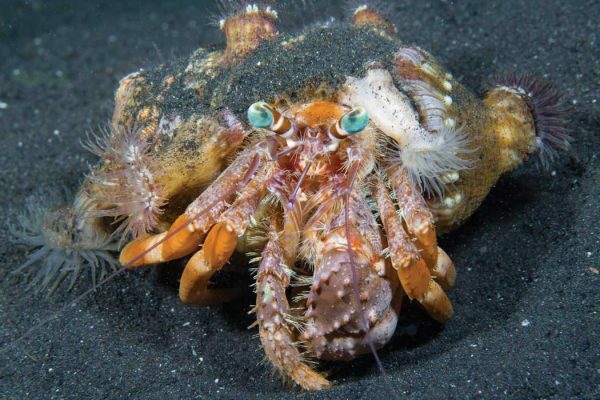 When underwater, the first step to communication is to gain your buddy’s attention. If you are not close enough to reach out and touch your buddy, you can try shouting through the regulator but they might not be able to hear you, especially if facing away from you. Rather than chasing after them, try getting their attention by making a sound stronger than your voice through the regulator. Try tapping on your tank with a hard object such as a stainless steel clip. Or you can use a nifty accessory aptly named a tank banger, which easily attaches to your scuba tank and produces a loud sound when you bang the device against your scuba tank. Another very useful accessory is the Dive AlertPLUS ™ — a piercingly loud air-powered horn that attaches to the low-pressure inflator on your buoyancy compensator (BC). It has two operating modes: subsurface and surface. When used at the surface it produces a sound that, according to the manufacturer, has been heard a mile away. Keep in mind the “silent world” thing is part of the beauty of diving. There will certainly be times when you want to share a cool something or other with a buddy and there will be times when you need to gain their attention for safety-related reasons. But we’d like to caution you not to be “that diver” who hammers away with your signaling device, making noise about every little thing you see. Save the tank banging for when something’s really special or when you need assistance, stat. We suggest you and your buddy work out a “Morse code”-like pattern of bangs you can use to alert one another. 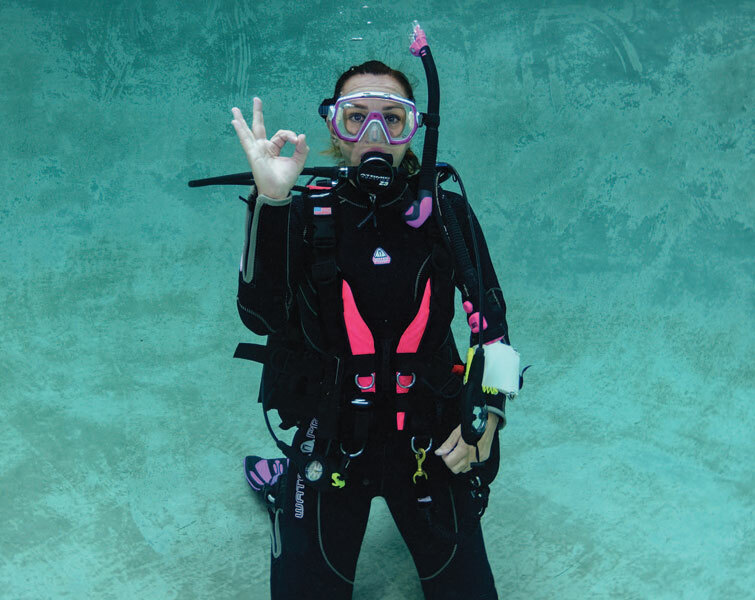 [ONE] The most commonly used hand signal for divers is the “ok” sign. Photo by Barry & Ruth Guimbellot. If you are not okay, there’s a hand signal for that. Hold your hand out horizontally in front of you, palm facing down and move your hand in a horizontal-to-vertical rocking motion so that your hand goes vertical (thumb facing up) and then horizontal (palm down) again. Do this a few times. After giving this “not ok — something’s wrong” signal, attempt to illustrate what’s not right by pointing to the problem or otherwise gesturing to your buddy so he or she can assist you. For instance, if you are having difficulty equalizing, point to your ear. If you are feeling chilled, cross your arms to simulate shivering. [TWO] We use “thumbs down/thumbs up” to signal descents and ascents. Photo by Barry & Ruth Guimbellot. [THREE] Signal to level off by moving your hand, palm down, horizontally in front of your torso. Photo by Barry & Ruth Guimbellot. Another common directional signal is “level off” — which is performed by moving your hand, palm down, horizontally in front you (Photo 3). This signal means you and your buddy or dive group should remain at this depth. [FOUR] The “buddy-up” signal is made by placing your index fingers side by side. Photo by Barry & Ruth Guimbellot. [FIVE] The simplest way to convey dive data is to show your gauges to your buddy or the dive guide. Photo by Barry & Ruth Guimbellot. Always monitor your gauges carefully to avoid running low on breathing gas. To signal that you are running low on air, wave a closed fist back and forth at chest level. 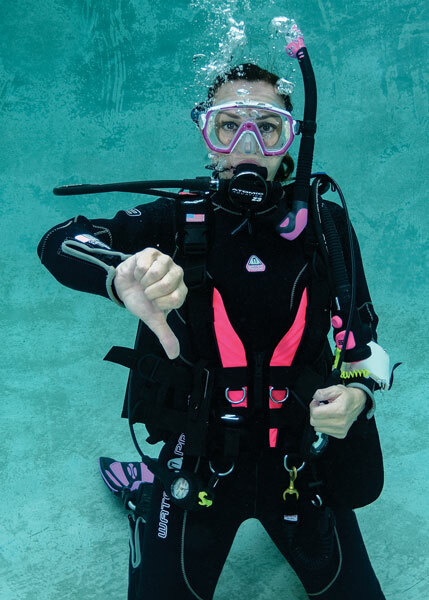 Two hand signals are routinely used to indicate, “I’m out of air.” You can use your hand to make a slashing back-and-forth motion at the neck and/or tap your fingers over your mouth/regulator. 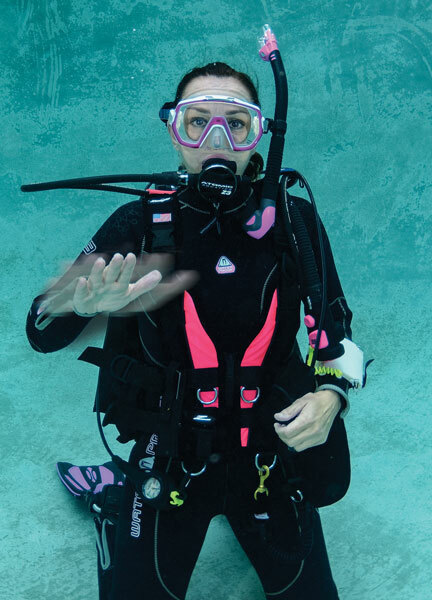 There are instances when your buddy or dive guide might use several underwater hand signals in a row to convey instructions, like, “Buddy up, level off at 15 feet (4.6 m) for three minutes and then surface.” This is why it’s important for you to know the underwater hand signals and gestures that are considered common and universal. 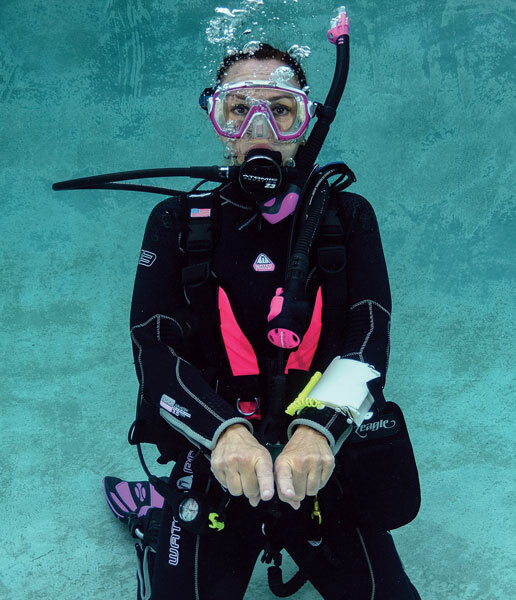 If it’s been a while since your last dive trip, you might find it useful to review your communications skills just the same as you’d brush up on your basic scuba skills. Feeling confident that you can communicate clearly will go a long way toward your having a safe and enjoyable dive. Photo by Barry & Ruth Guimbellot. 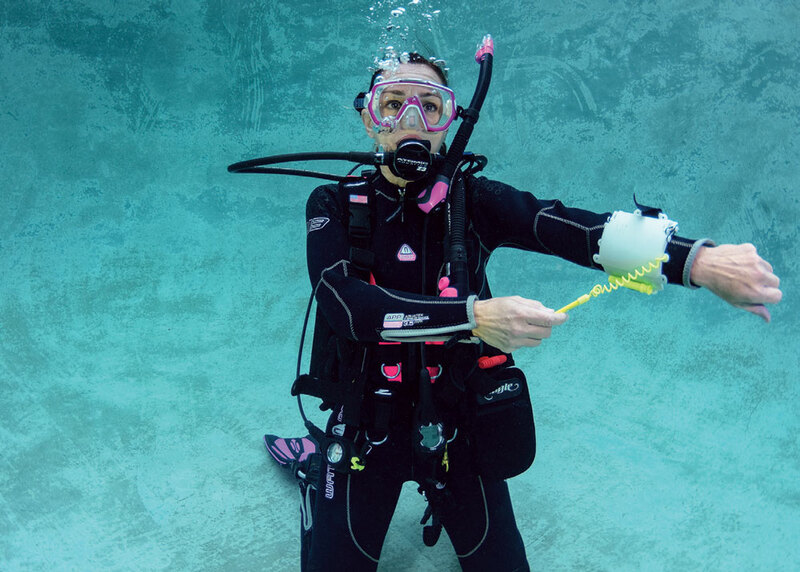 Although divers can communicate a lot of different things using simple underwater hand signals, there are some instances where signaling falls short. This is when having a slate comes in handy. You can simply jot down a quick note and share it with your buddy. Slates come in a variety of types and sizes. Ask the staff at your local dive center to show you a few examples.